Sensitivity ratings are generally given a the minimum ‘Lux’ levels at which the camera will produce a usable image. The lower the Lux number, the lower the light levels at which the CCTV Camera will produce an acceptable image. In other words the lower the Lux level rating, the more light sensitive the camera. During the day, the amount of illumination reaching a scene, allowing maximum identification of objects. On a cloudy or overcast day, less light is received by the objects in the scene, resulting in less contrast. To produce an optimum camera picture under the wide variation in light level - such as occurs when the sun is obscured by cloud; an automatic-iris camera system is required. Typically, scene illumination measured in foot-candles ftcd - can vary over a range of 10,000 to 1 (or more). which exceeds the operating range of most cameras for producing good quality video images. 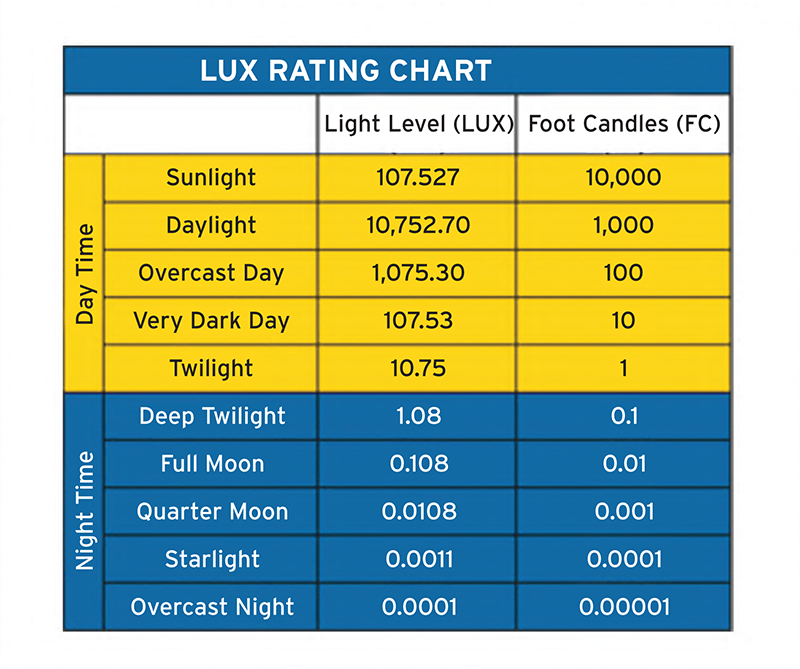 The chart above summarises the light levels occurring under daylight and there love light level conditions. The equivalent metric measure of light level (Lux) compared with the English ftcd is given.